Outstanding contributions to advances in information and design technologies recently earned Arizona State University engineer Jami Shah a Lifetime Achievement Award from the American Society of Mechanical Engineers (ASME). Shah is a professor in the School for Matter, Transport and Energy Engineering, one of ASU’s Ira A. Fulton Schools of Engineering. He has been teaching in the mechanical engineering program and conducting research at the university for more than two decades. His work has helped propel the evolution of computers from functioning merely as “primitive number crunchers and equation solvers” to technology that aids the human creative process, he explains. 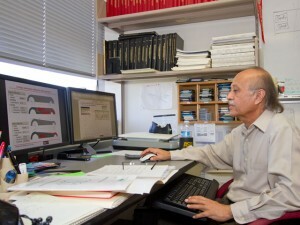 Shah has focused on enhancing the capabilities of computer-aided design (CAD) and computer-aided manufacturing (CAM). Through that effort he has become a leader in the emerging fields of machine informatics and cognitive informatics. Machine informatics explores how to improve the performance of technologies through advances in the construction and operation of machinery and related tools. Cognitive informatics looks at “how computers can work as your partner” in creativity, Shah says. His research has been on the cutting edge of advances that have enabled CAD to progress beyond providing the basic geometry for design to performing increasingly more complex design conceptualization functions. His work to fill that need has attracted support over the years from the National Science Foundation and Defense Advanced Research Projects Agency, which commissions advanced research for the U.S. Department of Defense. He also has earned industry support from major corporations such as General Electric, Texas Instruments and Boeing. Many of his Shah’s students have followed in his footsteps in their careers by implementing technological enhancements into commercial CAD systems. Shah has authored two books on subjects in his area of expertise, has had more than 220 research papers published and is a partner in development of two inventions that have been granted U.S. patents. He is also the founding chief editor of the ASME Journal of Computing and Information Science in Engineering. Under Shah’s leadership, the journal became a “flagship” publication for leaders in computing science and computing technology, says colleague Xiaoping Qian, an associate professor in the department of Mechanical, Materials and Aerospace Engineering at the Illinois Institute of Technology. Shah’s accomplishments “significantly exceed all the criteria” for an ASME Lifetime Achievement Reward, Qian says. With his letter nominating Shah for the honor, Qian included testimonials from other colleagues in both academia and industry to confirm Shah’s stature as a pioneer in his field throughout the past 25 years. Shah joins select company among winners of the ASME Lifetime Achievement Award in computer and information engineering. All of the previous recipients have been members of the National Academy of Engineers, one of the highest professional honors bestowed on engineers.